Chipmaster-Z SMD-1000-Z | Welcome to A.P.E. The Chipmaster-Z is identical in specification to the standard Chipmaster except for the addition of an electric Z axis, which provides easy clearance of the nozzle thus avoiding obstructions. Particularly convenient for awkward height components. Automated Z AxisThe Chipmaster-Z automates the Z axis adjustment and assists the user in clearing the area after rework. 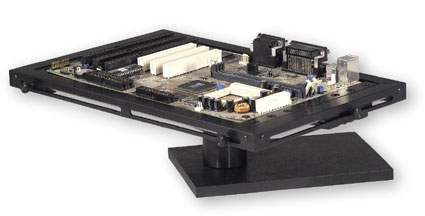 It also helps access the component without concern of surrounding obstructions. The Chipmaster-Z SMD-1003-Z package, with optional features (see below), has been discounted to introduce this unique system. These features ensure that the Chipmaster-Z functions as intended. 8100-1003-114-Z Chipmaster 110v Z-Axis Unit Includes: Power Supply 110v, Reflow Head with 1.750″ of Z-Axis travel (1200watts), Digital Controller with all 4 modes of operation, 8″ x 12″ Frame Holder, Self-Contained Vacuum IC removal device, SMD Tool Kit, Halogen Light w/ mounting bracket, Chipmaster T and Sniper Demonstration video, Foot Pedal, Power Cord, and three user-selected nozzles. 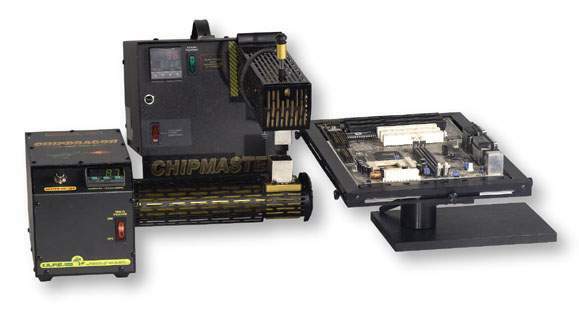 8100-1023-114-Z Chipmaster 220v Z-Axis Unit Includes: Power Supply 220v, Reflow Head with 1.750″ of Z-Axis travel (1200watts), Digital Controller with all 4 modes of operation, 8″ x 12″ Frame Holder, Self-Contained Vacuum IC removal device, SMD Tool Kit, Halogen Light w/ mounting bracket, Chipmaster T and Sniper Demonstration video, Foot Pedal, Power Cord, and three user-selected nozzles. Underboard HeatingThe SMD-1000-Z is a necessary rework station when used with a Radiant Hotplate or other fixed underboard heating system . It also serves as an economical alternative when used with the APE Dragon bottom Heater.